The Alphacool Eisblock HDX-2 is a massive passive cooler for your M.2 SSD. The included PCIe card, on which the water block is mounted, also provides your SSD with an outstanding bandwidth of up to 3900 MB/s. Possible bandwidth of up to 3900 MB/s. The Alphacool Eisblock HDX-2 cooler offers outstanding cooling for your M.2 SSD. Continuous, substantial data transfer dramatically lowers the performance of an M.2 SSD without cooling and can actually drop performance down to as little as 10% of its actual capability. Transferring large amounts of data heats up the memory controller and chips until a safety mechanism kicks in and severely throttles the SSD’s performance. This can be countered by actively cooling the SSD. After developing the M.2 HDX cooler for motherboards with M.2 slots, Alphacool is now offering the HDX-2, a massive passive cooler with a cooling surface many times larger than the HDX M.2 cooler. The M.2 SSD is screwed onto a PCIe card and then mounted onto the water block. The cooler consists of a large passive aluminium heatsink that completely covers the M.2 SSD. 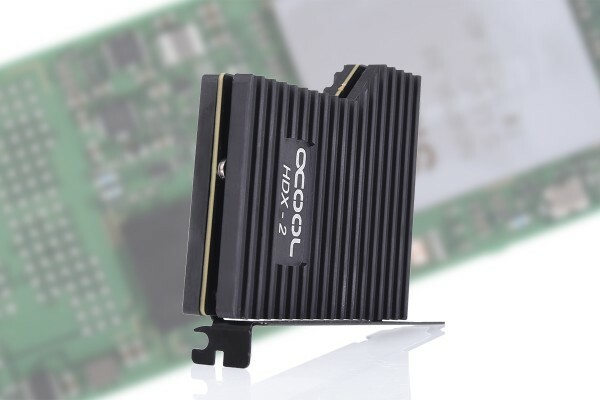 This optimally cools the entire M.2 SSD and prevents a decrease in performance due to high temperatures. The PCIe card is plugged into a 4xPCIe slot and screwed onto the case. With it, data can be transferred at speeds of up to 3900 MB/s. This is a much faster bandwidth than most SSDs can even use. That’s a 600% improvement over conventional 2.5” SATA-SSDs, since the maximum bandwidth for those is 640 MB/s. Even compared to motherboard slots, the plug-in card combined with the cooler still offers substantially higher transfer rates. M.2 SSDs on motherboards are often only plugged into a 2xPCIe slot, which halves the maximum data transfer rate. It is also difficult to properly cool an M.2 SSD on a motherboard, since the graphics card is generally mounted directly above or below it and tends to significantly heat up the surrounding area. With the Alphacool Eisblock HDX-2, you can avoid all these problems and get the best performance from your M.2 SSD. There is a protective film covering the PCI-E plug contact. This must be removed before initial operation. Can this be used without a cooling block/water cooling attached? You do not need a water cooling loop for this cooler. It is a stand-alone passive cooling block for M.2 SSDs. Do HDX-2 have leds or only kryo m2 EVO? This cooling block have no LEDs option. This is a unique item. it even feels different. When i received it , it felt heavy and the finish was like slate for the heatsinks. Put it all together in 10mins and you have an excellent passive cooler. it really really works. I have used this for a week now and did some tests using a samsung pro 960 512gb M.2 . At idle i get 25C and at load i got 29C. it was 29C copying 230gb from my other drive. The card itself has no loss if your wondering. i clocked the same on the MB slot and this pcie card. The thermal pads are all colour coded and the manual was clear on what is expected. You do have to understand that this has a back plate which is a few mm behind the card line. So if you have a GPU that is slight over 2 slots it might lightly touch the back plate. i would say its 4 fold the size of an EK m.2 cooler and it works!!. Hej! Måste få säga att det här är en rejäl grej, ingen plast här inte. Jag uppdaterade mitt system och drog in ett Samsung 950-series PRO 256GB M.2 NVMe som blev över. Inga svårigheter med installation, bara ta det lugnt med de skruvar Som kom med, en bra bruksanvisning kom med så hoppa inte Över att läsa igenom. P.S. Behöver inte kommentera pingvin stången, efter flera års glatt tuggande!. Den är grymt bra. spel som jag har testat ghost war wildlands rainbow six siege Overwatch Mad max Cod WWII [beta] och högsta grader som jag kom på är 50grader@700-750RPM med noctua Fans. Tidigare har jag corsiar 280mm med LINK. den kom upp 50 grader@1100-1450RPM med noctua fans. Aida 64 test kommer upp 55- 60grader@850RPM. Om du har plats för 420mm? köp den.